Hao643.com – How to remove? Hao643.com is another search engine targeting people living in Asia. Unfortunately, malware researchers cannot say that it is a trustworthy search tool even though it works as a search engine and even presents users with buttons to help them open certain websites easier and quicker. They say that this website is another browser hijacker presenting itself as a legitimate search provider to make sure that users keep it. Do not be one of those users who let it stay because the presence of Hao643.com might cause a bunch of problems to you. Experts recommend going to remove Hao643.com as soon as they discover it set on browsers because this search tool is not what it claims to be, and it will diminish your browsing experience to a great extent. 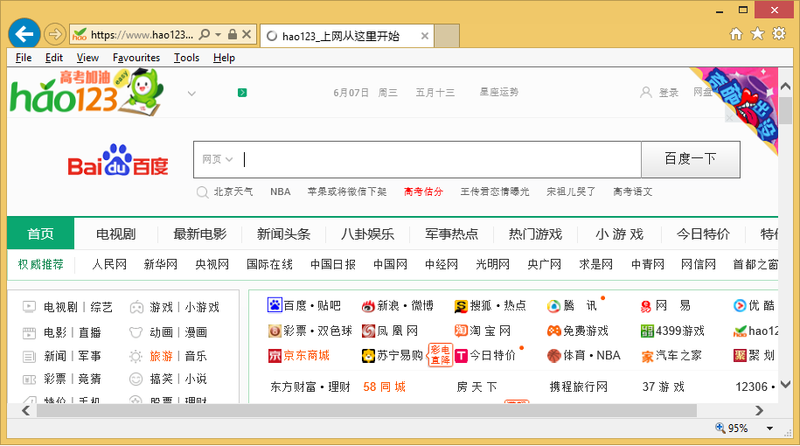 We do not say that it will be easy to delete Hao643.com, but it is the only way to clear your browsers and make it possible to set a new reputable search tool. Hao643.com is a part of a browser hijacker, as we already know, so the entrance of this infection means that a new search tool will become set on browsers without a user’s consent. It will be opened for you when you launch your browser, and, unfortunately, you could not change this easily because this browser hijacker has changed all browsers’ you have installed on your computer settings. Do not use Hao643.com to search the web because you will be provided with tons of commercial advertisements. You could not avoid them, unfortunately, which means that you will click on them one day. Advertisements shown by search tools browser hijackers promote are quite dangerous in a sense that they might redirect to pages with untrustworthy software. They might also pretend to be online shops or simply try to convince users to take a survey and submit personal details. These websites, luckily, can be avoided. Start from going to implement the Hao643.com removal. Where does Hao643.com come from? We would not believe if you said that you see Hao643.com because you set it voluntarily because we know how this infection is usually spread. It arrives on computers using the bundling method in most cases, i.e. it travels bundled with freeware and shareware. This tactic is used to hide from users and enter PCs secretly. It does not mean that it is impossible to prevent these infections from entering computers – the easy way to do that is to install a security application. How do I delete Hao643.com from browsers? There are two ways to implement the Hao643.com removal from your browsers, so choose the more suitable one for you. First, you can uninstall Hao643.com from web browsers manually. If this removal method is not for you, go to remove Hao643.com from your browsers in an automatic manner. You could only do that if you get a legitimate anti-malware or anti-spyware scanner from the web, but, believe us, it is worth investing in one because it will not only erase this infection for you, but you will also be protected 24/7.